The Riding Club of Barrington Hills hosted its annual fall Barn Tour on Sat., October 13, 2018 for more than 100 eager guests. The gracious owners of three well-established, state-of-the-art Barrington equestrian properties shared their unique country lifestyles and showcased each barn’s purpose, design, and facilities. Guests stepped onto buses at Countryside Elementary School to head off to their first stop, at Uulke Farm in Barrington Hills. There, owner and hostess Laura Pedian offered appetizers and drinks along with a tour of her wonderful barn and its unique charm. North Barrington was the next stop on the Barn Tour for a visit to Old Barrington Farm. Trainer Amelia McArdle welcomed guests to a demonstration of the equitation and jumping skills of her students and their horses. Guests were also treated to a wonderful catered dinner and cocktails at Old Barrington Farm. The third stop brought guests back into Barrington Hills to Cresswood Farm located on County Line Road. Hostess Christy Cressey provided a tour of the barn and offered guests a wide assortment of dessert, coffee, and liqueurs. In addition to the gracious barn tour hosts and hostesses—Laura Pedian, Joyce and Dave McArdle, and Christy Cressey—other generous sponsors included Barrington Hills Farm, Mary and Paul Loeber of Plum Grove Farm, and Joyce and Dave McArdle for wines and staff support. To learn more about The Riding Club of Barrington Hills, visit online at www.RidingClubofBarringtonHills.com. Uulke Farm represents the dream fulfilled for its owner—to live in a barn with her horses. Her dream was inspired by her time living on the Serengeti plains in Africa with the Masai tribe and the pygmies, where people and animals lived closely together. passing between a green and gold 18th-century French tapestry, a large Kashan Persian rug from the 1920s, and beneath two crystal chandeliers. The owner, Laura Pedian, an interior designer, built the barn and designed its unique décor. The lovely indoor arena is accompanied by a viewing room complete with a kitchenette and professional décor. The horses all benefit from Laura’s devotion to their care and well-being. Uulke Farm is named after one of Laura’s beloved horses. Left: Tour guests (from left) Dawn Davis, Emily McHugh, Joan Abboud, and Judy Freeman. Right: The viewing room includes photosof the barn’s family of horses. Guests were welcomed to Old Barrington Farm for the second stop on the tour. Twelve years ago, Joyce and David McArdle started looking for a place close to the Barrington area where they could create their vision of the ideal equestrian community. Their family wanted to offer other families what they have loved—a beautiful country lifestyle where you can literally roll out of bed and walk to the barn. They found the ideal setting out in the country, yet just 10 minutes from the best schools, train, shopping, and other comforts of modern life. The farm is located on 60 acres of beautiful rolling and wooded land in North Barrington. Facilities include 40 stalls, indoor and outdoor riding arenas, open grass field for jumping, and miles of riding trails. Their years of touring equestrian facilities and interviewing professionals and enthusiasts helped to shape the vision of Old Barrington Farm. Their thoughtful design has created a special place where the care and training of horses is paramount. riding when they walked across the road to Horizon Farms from the McArdle’s Barrington Hills home. From left: Mikayla Foster, Alexis Bowen-Foster, Olivia Galley, Julie Smith, Amelia McArdle, and Frances McGinley. 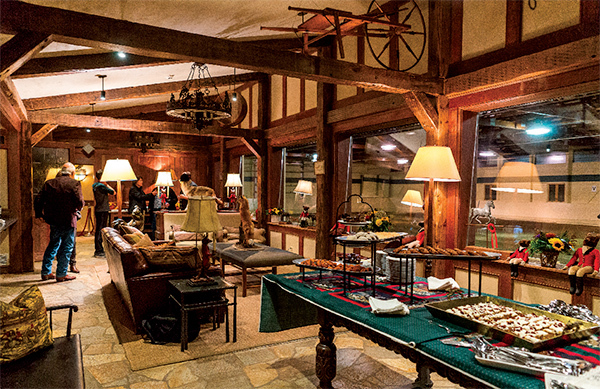 Right photo: The Club Room offers comfort and a view into the indoor arena. The Cressey family moved to 500 West County Line Road in 1988 and christened their 54 acres Cresswood Farm. With their three daughters, Monique, Charlotte, and Alicia, equestrian interests dominated their family, including with the Fox River Valley Pony Club, the Fox River Valley Hunt, and three-day eventing. Their love of horses resulted in their care of a variety of sport horses. 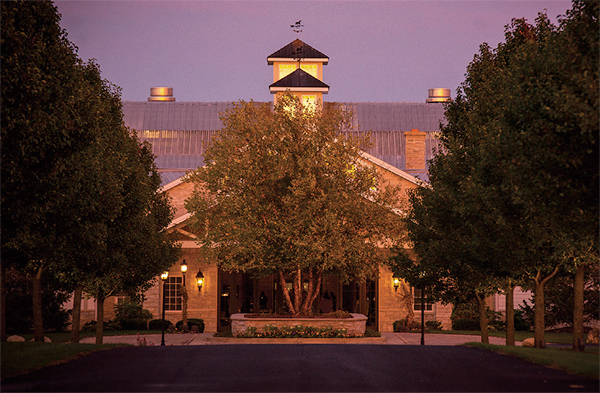 The Cressey family is a generous sponsor of the equestrian community that makes our village truly unique, so much so that the cross-country course for the annual Fox River Valley Pony Club horse trials includes a custom-designed replica of the Cresswood Farm barn, complete with a clock tower! In addressing the inevitable suburban sprawl surrounding Barrington Hills’ 5-acre zoning, the Cresseys, along with other supportive neighbors, have donated four acres to The Barrington Area Conservation Trust. This move disables the Illinois Department of Transportation from making Lake Cook Road, currently a two-lane road, into a four-lane road. The acreage is currently maintained as a native wetland. Left: Chuck Prettyman, Susan Schacht, and Maureen Prettyman. Right: The indoor arena offers 175' by 70' of riding room.